The sequence component triggers a series of child components defined by a playlist. It continuously advances (PlayContinuous) on the playlist in a sample-accurate way and depending on the play mode selected it will either loops back to the beginning or stop. 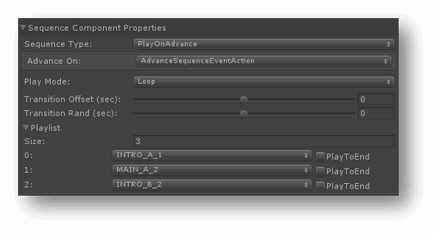 In advance mode it is possible to configure the sequence to advance to the next entry when an “AdvanceSequence” event action is received (PlayAdvance) or on a PlaySound event action.